July 1, 2016 By This post may contain affiliate links. 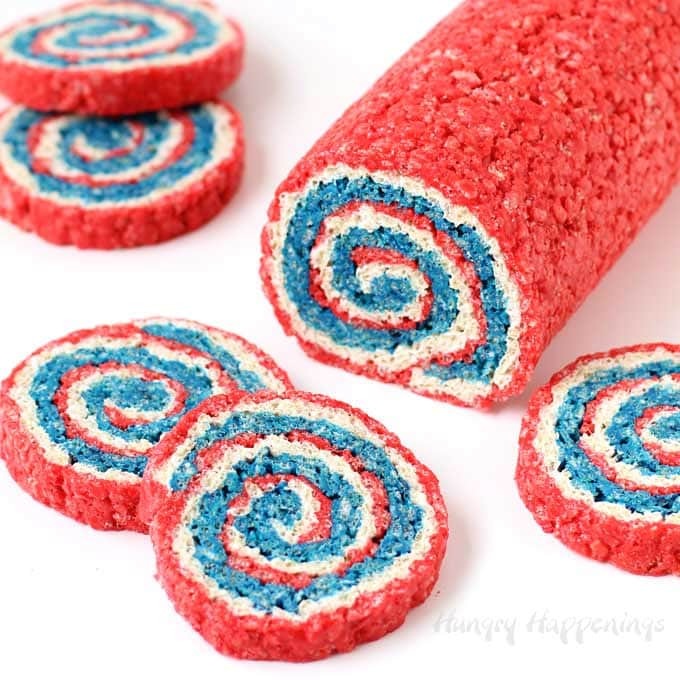 Celebrate the 4th of July with some festive Red, White and Blue Rice Krispie Treat Pinwheels. Layers of colorful marshmallow cereal treats are rolled up and cut to reveal patriotic swirls of color. How do you celebrate the 4th of July? For years we had big outdoor picnics with friends and family on the holiday, but as the summer temperatures have soared over the years, we’ve retreated indoors. No one in my family is all that happy about being outside when it’s super hot, especially me. 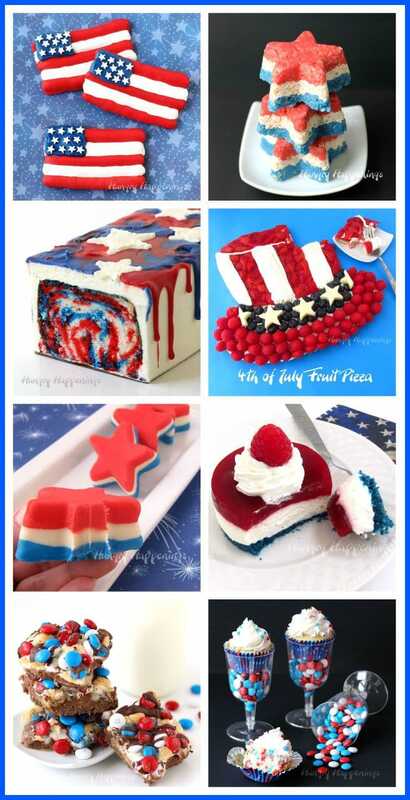 When I make desserts for our Fourth of July parties, I don’t even want to turn on the oven. When it’s 90+ degrees outside, I opt to make no-bake desserts for our parties like these Red, White, and Blue Rice Krispie Treat Pinwheels. 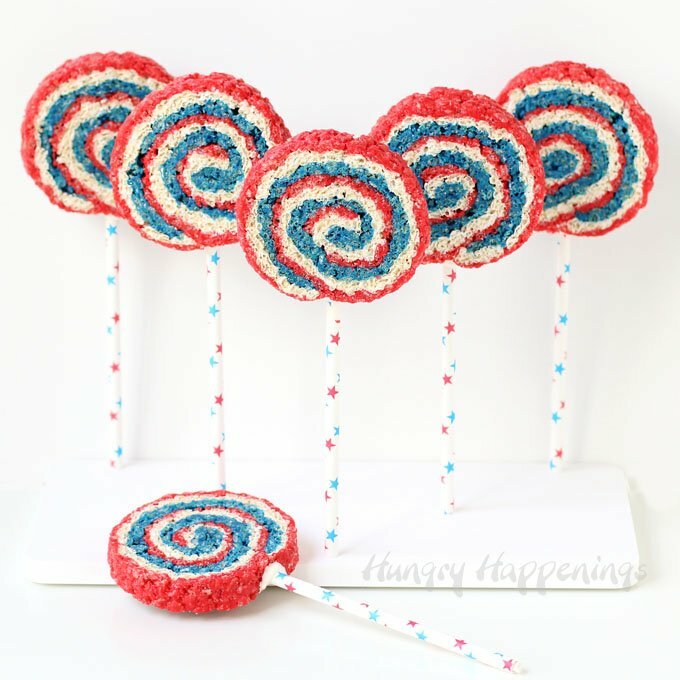 These cereal treat lollipops do require a little bit more work than making a pan of the cereal treat bars, but your party guests will be “oohing and ahhing” before the fireworks start once they see these on the dessert table. You start by making a simple rice krispie treat recipe, adding some candy melts to make each layer of this red, white, and blue dessert really vibrant. 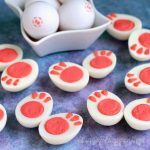 Not only will the red, white, and blue candy melts add color, but they will also add some structure to your cereal treats and will impart a nice sweet vanilla flavor as well. 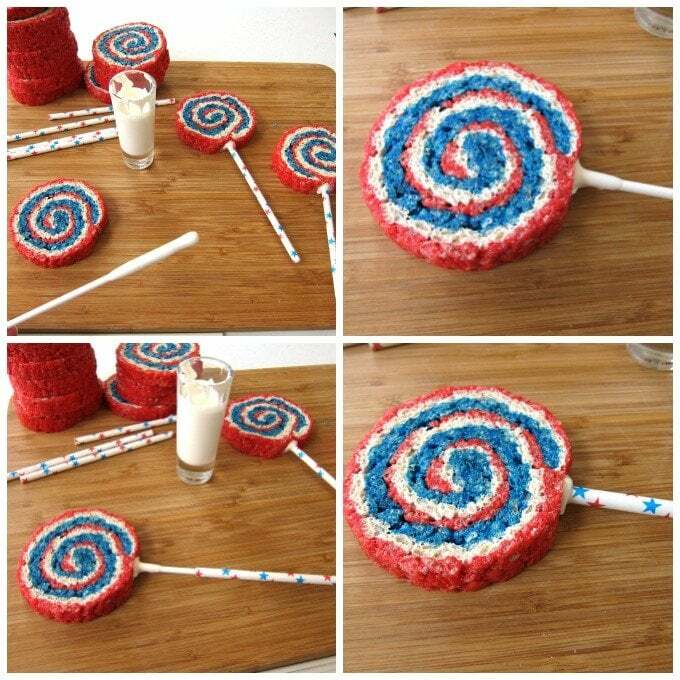 If you make the marshmallow cereal treats into lollipops, the candy melts will also help keep the pinwheels in their nice round shape. Before you begin making your rice krispie treats, you’ll need to prepare a pan. 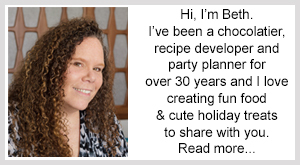 You can use a traditional 9X13 inch baking pan, or use a ¼ sheet pan, which is close in size to a 9X13 pan. Line the pan with parchment paper, then brush the parchment paper liberally with softened butter. Once your pan is ready, you’ll want to make the red rice krispie treat layer. 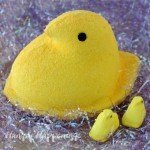 You can use the stove top method or the microwave method to melt the butter, marshmallows, and candy melts. I wanted my colors to be really vibrant, so I added a few drops of red food coloring. 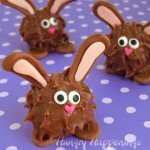 You can use candy coloring, icing coloring, or even the grocery store variety of liquid food coloring. I used Wilton’s Color Right Red coloring, so my treats are really bright red. Once you get the marshmallow mixture the color you want, stir in the cereal. Pour the cereal mixture out onto your pan and press it into a thin even layer. Make sure you fill the bottom of the pan completely. 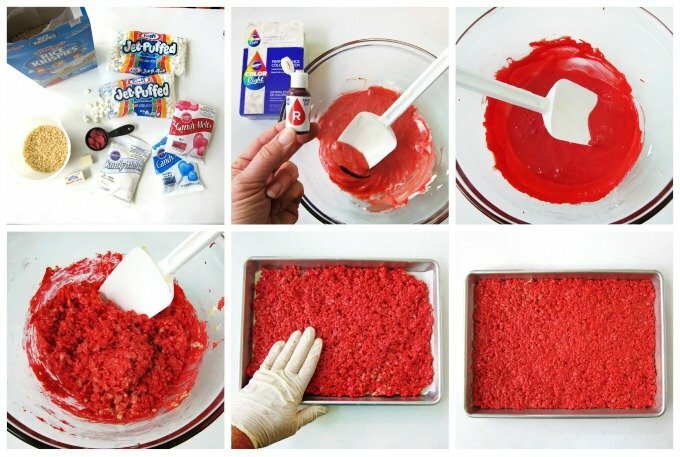 Then make your white rice krispie treat mixture and spread it on top of the red layer, adding white icing coloring. Press it down so that it completely covers the red layer. Finally add a layer of the blue cereal treat. Press down to compact the layers. Flip the treat out onto a silicone mat or another butter coated piece of parchment paper. 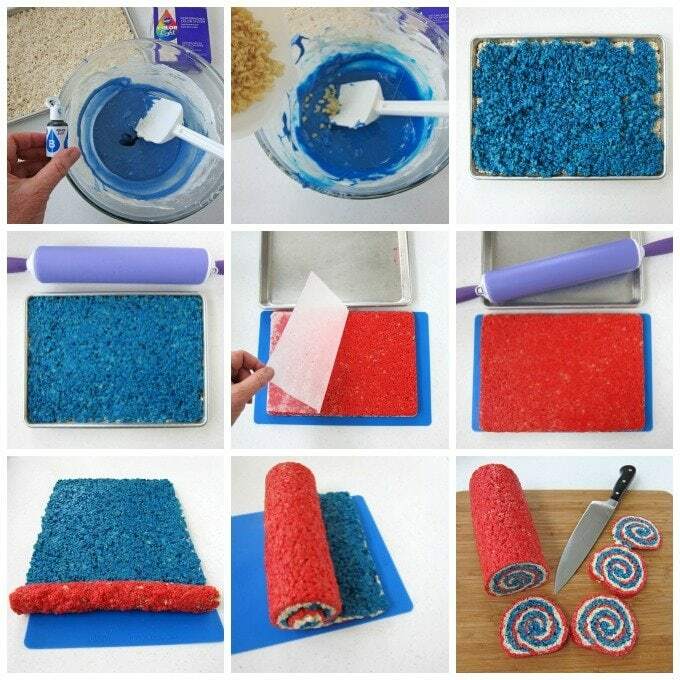 Roll over the treat with a rolling pin, flattening it and spreading it out about an inch both ways. Begin rolling at the short end, pinching together any spots of cereal that pull apart, until the entire treat it rolled up. Cut into 12 slices and they are ready to serve. Quick and easy! Dip just the tip of a long lollipop stick into some melted white Candy Melts and insert it into the pinwheel. You can also slide a paper straw over top of the lollipop stick to make them more festive. Just be sure you have some candy melts on the lollipop stick so that the straw sticks in place. Let the candy harden before picking up the lollipops. These layers of red, white and blue marshmallow cereal bars swirled into pinwheels are the perfect 4th of July treat. It's so simple to make and everyone will love a good Rice Krispie Treat Pinwheel! Line a 9x13 baking pan with a well buttered piece of parchment or wax paper. Pour marshmallows, butter and red candy melts into a large microwave safe bowl. Heat on high power for 30 second increments, stirring after each, until melted and smooth. Stir in red food coloring until the marshmallows are vibrant red. Pour in cereal and mix until well combined. Spread into an even layer in pan. 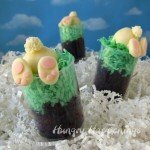 Repeat the process above using white candy melts and white food coloring. Spread the white cereal layer over the red layer. Repeat using blue candy melts and blue coloring. Spread the blue layer over the white layer. Press down on the blue layer to compact all three layers. 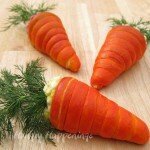 Remove from pan and set on a silicone mat or buttered parchment paper. Use a rolling pin to compress the cereal, spreading it out about an inch all around the rectangle. 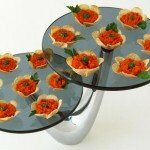 Roll up into a pinwheel from the short side. If you’re looking for other 4th of July Recipes, click the link and explore all my other Independence Day inspired food. Thanks, Karen. I would definitely travel to Colorado if you get a change. It was a great trip. Definitely not easy. Missed having them for the 4th. Layers would not stick together. Maybe chill between rolling layers?. Taste is a little sweeter than original krispie treats.